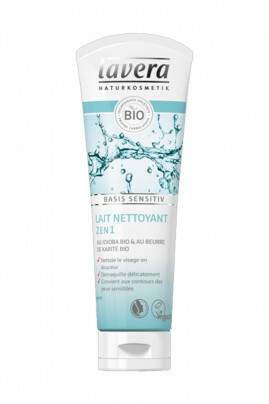 Clean your skin gently with Lavera Basis Sensitiv 2-in-1 Cleaner Cleansing Milk. This natural care combines 2 actions in one gesture: it cleans the skin thoroughly while removing the makeup. Formulated with organic shea butter and organic jojoba vegetable oil, this Vegan Cleansing Milk provides hydration and comfort to your skin. Its melting texture allows a gentle and delicate cleaning. This cleansing milk is perfectly suited for the sensitive eye contour. Vegan Lavera 2-in-1 Cleansing Milk for gentle cleansing ! Apply on your skin by making circular movements to activate the blood circulation. Then rinse with warm water. For the eye contour, drop a hazelnut of this care 2 in 1 on a wet cotton and gently remove make-up. To take care of your sensitive skin, moisturize your face with Lavera Vegan Care Cream.